From time to time, US - China Law Group has informative seminars on topics such as "How to do business in China"," How to do business in the U.S.", and "What you need to know about immigration law." In addition to our legal point of view, we may also invite speakers outside of the law firm to have round-table discussions. For example, we may invite founders of startups and corporate executives to talk about their business experience. If you want us to notify you about these seminars, please email us at seminar@uschinalawgroup.com with the subject "seminar" and the following information: name, title, company name, phone number, and topics of personal interest. August 24, 2003. 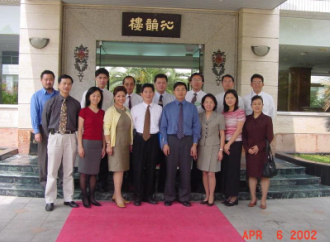 The Silicon Valley Chinese Engineer Association's (SCEA) 2003 Annual Meeting and Conference. Title: A Basic Legal Guide to Investing in China. May 31, 2003. SINA Small Business Forum. Title: A Basic Legal Guide for Small Businesses. Bing Rui, a U.S.-China Law Group Partner, meets with the government officials in Fuzhou, Fujian province. .......................Copyright(C) 2002 U.S.-China Law Group. All rights reserved.